The weekly courseload was heavy compared to some of my other classes, but the material was always engaging and enlightening. I really liked the way that Mrs. Smith set up the class so that we learned the content several times through many different forms. How do our students do on the AP exams? AP Homeschoolers Inc. is a Richman family corporation. The owners are Howard and Susan Richman and their daughter Maya Inspektor. It grew out of PA Homeschoolers, a family business started by Howard and Susan Richman, has been serving the homeschooling community in Pennsylvania and nationwide for more than thirty years. In 1998, Howard and Susan wanted to find a way to give their own high-school homeschooled children outside structure, challenging coursework, and academic community: these online courses were born. AP Homeschoolers was one of the first online providers for AP test preparation courses for homeschoolers. From just a few courses and a website programmed by Howard and Susan's teenage son, these online courses have grown through word of mouth into a well-organized extensive roster of high-quality courses, fueled by passionate teachers and satisfied students. In fact, many past students have gone on to teach online courses themselves, including AP US Government teacher Rachel Califf, AP US History teacher Daniel Burns, AP World History teacher Gwen Smith, AP English Literature teacher Liliana Serbicki, AP English Language teacher Anna Rebmann, and Howard and Susan's own daughter, AP English teacher Maya Inspektor. Today, PA Homeschoolers offers dozens of AP courses and have served thousands of homeschooled students worldwide. We seek out master teachers who combine passion for their subject areas with understanding of the homeschooling community's unique needs. We hope your family will find courses here that help you fulfill your goals for the coming school year. While our courses are focused on preparing students for the Advanced Placement exams in the spring, they offer much more than mere test preparation. Our courses run from early fall to late spring, offering personal interaction with master teachers and motivated classmates. Each course is individually shaped by its instructor and offers its own structure, degree of interactivity, and academic goals, with everything aligned to the College Board AP program requirements. By reading course descriptions and class reviews, prospective parents and students can find courses appropriate to any learning style. We feel that online courses should do more than replace a brick-and-mortar classroom with a website, so we seek out teachers who understand the unique needs of homeschooling students and the potential of online education. All of our AP Online classes are authorized through the College Board Audit process— our teachers each have their syllabus approved by experienced course reviewers, meeting all College Board AP guidelines for course coverage. PA Homeschoolers AP Online now also sends out official transcripts verifying AP course completion and course grades—we can send these on to colleges, NCAA, the military academies, or scholarship programs as requested by the family, for a $5 fee (AP Transcript Request Form can be found via the link at the bottom of the page). Perhaps one of the best aspects of our classes is that in the many years that we have offered AP Online, we have developed a community of homeschool student scholars who bring to each class the positive ways of interacting that they have learned in previous classes. 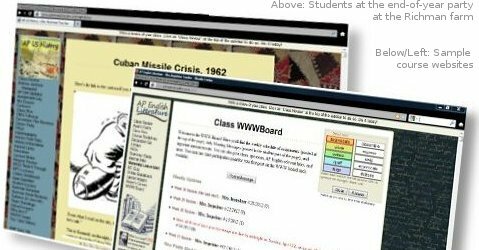 It’s not unusual for students to take one AP Online class in 10th grade (and we’ve had some very bright 9th graders also), and then take more in 11th and more in 12th grade— first checking with their new PA Homeschoolers AP Online friends, so that they can plan to be in class together once more. Many students form positive friendships that last beyond their high school at home years—and at least a few students have opted to be college roommates after learning together in AP Online! We host dozens of students from all over the country each spring for a Memorial Day weekend party at the Richman Farm in Western Pennsylvania, and it's a pleasure to see online friendships transition into the real world. You do not have to live in Pennsylvania to take part. These classes, as in the past, are only available to homeschooled students – full-time public and private ‘brick and mortar’ school students, as well as Pennsylvania public cyber-charter school students, are not eligible to participate. We fully realize that a growing number of homeschool students may take part-time coursework at a local public or private school or college, or have oversight from a homeschool program such as Mother of Divine Grace School, Clonlara School, or a private school set up to help homeschoolers (this option is often used in California). If you have a question about your student's status and eligibility, please send us an email at richmans@pahomeschoolers.com . Registration is now open for the 2018-2019 school year. Courses accept students based on rolling admission, so some will fill up as soon as May or June, while others may accept students up through the start of the school year. To apply for courses, apply directly through each individual teacher by following the directions in the course description; admittance requirements for each course varies. Once a student has been accepted into a course, the student should submit payment for the course through our secure online store, or via check (we also have a payment plan). NOTE: a couple of classes do *not* have a specific application-- if you meet the criteria set by the teacher, just pay tuition and you're in. 50% of our students, 14% of school students were "extremely qualified". 76% of our students, 34% of school students were "very qualified" or better. 93% of our students, 58% of school students were "qualified" or better. These are the 452 exam results from those students who put down the PA Homeschoolers online provider code, as instructed, when they took the exam. The PA Homeschoolers Online students who did not put down our code may have scored differently. The distribution of school student scores for the 2012 test administration are not yet available and may have been different from the 2011 distribution graphed above. All of PA Homeschoolers online classes from the 2011-2012 school year are represented by these scores: Art History, Biology, Calculus AB, Calculus BC, Chemistry, Comparative Government, Computer Science, English Language, English Literature, European History, Human Geography, Macroeconomics, Music, Physics B, Psychology, Spanish Language, Statistics, Studio Art Drawing, Studio Art 2D Design, US Government, US History and World History. We have done very little advertising of our courses over the years, and our student body has grown through strong word of mouth and repeat customers. Many college admissions consultants working with bright homeschool students specially recommend our courses. For example, Jeannette Webb of Aiming Higher www.aimhigherconsultants.com and Denise Boiko, author of Homeschooled and Headed for College www.homeschoolroadmap.com, regularly recommend our AP Online classes to the students they work with. Our classes are discussed frequently on high school at home email lists and online forums— and the parents and students involved are the best ‘promoters’ of our classes! Probably the best way to see what others have thought of our courses is to be sure to read the student reviews after each course description. These reviews are automatically posted, unedited, and represent the opinions of past students, as well as parents. In addition, past students share their thoughts on our PA Homeschoolers website-- Andrew Min of New Jersey (and now a sophomore at Princeton, along with another of our AP Online alumni!) reflects on the long-term value of taking our AP Online classes, and homeschool 12th grader Marisa Chow (heading to Princeton next year to join her AP scholar brother Evan!) of California writes about homeschoolers and socialization, mentioning the positive role our AP Online classes have played in developing a wonderful network of friends all across the nation, and even around the world. Because we believe in giving individual teachers creative control over their courses, the best way to find out about each course is to read each course description and the reviews from past students. In addition, you are welcome to contact individual teachers with further questions. Many of our AP teachers will be presenting a session about their classes at the Monday, April 16, 2018 High School at Home Conference near Carlisle Pennsylvania sponsored by PA Homeschoolers Accreditation Agency giving you a chance to meet the teachers. Several teachers will also give sessions related to their course content, which would be helpful to families looking to prepare students for future AP level work. WE often also have a student-panel session about AP classes at the conference. So come and learn more about the scope and format of the classes!